Nero (; Latin: Nerō Claudius Caesar Augustus Germanicus) (15 December 37 AD – 9 June 68 AD) was the last emperor of the Julio-Claudian dynasty. He was adopted by his great-uncle Claudius and became Claudius' heir and successor. Like Claudius, Nero became emperor with the consent of the Praetorian Guard. Nero's mother, Agrippina the Younger, was likely implicated in Claudius' death and Nero's nomination as emperor. She dominated Nero's early life and decisions until he cast her off. Five years into his reign, he had her murdered. During the early years of his reign, Nero was content to be guided by his mother, his tutor Lucius Annaeus Seneca and his Praetorian prefect, Sextus Afranius Burrus. As time passed, he started to play a more active and independent role in government and foreign policy. During his reign, the redoubtable general Corbulo conducted a successful war and negotiated peace with the Parthian Empire. His general Suetonius Paulinus crushed a major revolt in Britain, led by the Iceni Queen Boudica. The Bosporan Kingdom was briefly annexed to the empire, and the First Jewish–Roman War began. Nero focused much of his attention on diplomacy, trade and the cultural life of the empire, ordering theatres built and promoting athletic games. He made public appearances as a poet, musician and charioteer; in the eyes of traditionalists, this undermined the dignity and authority of his person, status and office. His extravagant, empire-wide program of public and private works was funded by a rise in taxes that was much resented by the middle and upper classes. Various plots against his life were revealed; the ringleaders, most of them Nero's own courtiers, were executed. In 68 AD Vindex, governor of the Gaulish territory Gallia Lugdunensis, rebelled. He was supported by Galba, the governor of Hispania Tarraconensis. Vindex's revolt failed in its immediate aim but Nero fled Rome when Rome's discontented civil and military authorities chose Galba as emperor. He committed suicide on June 9, 68 A.D., when he learned that he had been tried in absentia and condemned to death as a public enemy, making him the first Roman Emperor to commit suicide. His death ended the Julio-Claudian dynasty, sparking a brief period of civil wars known as the Year of the Four Emperors. Nero's rule is usually associated with tyranny and extravagance; his more infamous executions include that of his mother. Most Roman sources, such as Suetonius and Cassius Dio, offer overwhelmingly negative assessments of his personality and reign; Tacitus claims that the Roman people thought him compulsive and corrupt. Many Romans believed that the Great Fire of Rome was instigated by Nero to clear the way for his planned palatial complex, the Domus Aurea. He was said to have seized Christians as scapegoats for the fire and burned them alive, seemingly motivated not by public justice but by personal cruelty. Some modern historians question the reliability of the ancient sources on Nero's tyrannical acts. A few sources paint Nero in a more favourable light. There is evidence of his popularity among the Roman commoners, especially in the eastern provinces of the Empire, where a popular legend arose that Nero had not died and would return. At least three leaders of short-lived, failed rebellions presented themselves as "Nero reborn", to enlist popular support. Lucius Domitius Ahenobarbus, Nero, was born on 15 December 37 AD in Antium. He was the only son of Gnaeus Domitius Ahenobarbus and Agrippina the Younger. His maternal grandparents were Germanicus and Agrippina the Elder. His mother was Caligula's sister. He was Augustus' great great grandson, descended from the first Emperor's only daughter Julia. The ancient biographer Suetonius was critical of Nero's ancestors. He wrote that Augustus had reproached Nero's grandfather for his unseemly enjoyment of violent gladiator games. Nero's father was said to be "irascible and brutal". According to Jürgen Malitz, Suetonius wrote that both "enjoyed chariot races and theater performances to a degree not befitting their position." Nero's father, Domitius, died in 40 AD. A few years before his death, Domitius had been involved in a political scandal that, according to Malitz, "could have cost him his life if Tiberius had not died in the year 37." In the previous year, 39 AD, Nero's mother, Agrippina had been caught up in a scandal of her own. Caligula's beloved sister Drusilla had recently died and Caligula began to feel threatened by his brother-in-law Marcus Aemilius Lepidus. Agrippina was suspected of adultery with her brother-in-law and was forced to carry the funerary urn after Lepidus' execution. Caligula then banished his two surviving sisters, Agrippina and Julia Livilla, to a remote island in the Mediterranean. According to The Oxford Encyclopedia of Ancient Greece and Rome, Agrippina was exiled for plotting to overthrow Caligula. Nero's inheritance was taken from him and he was sent to live with his paternal aunt Domitia Lepida, who was the mother of Claudius' third wife Valeria Messalina. Caligula's short reign lasted from 37 AD until 41 AD.. He died from multiple stab wounds in January of 41 AD after being ambushed by his own Praetorian Guard on the Palatine. Claudius succeeded Caligula as Emperor. Agrippina married Claudius in 49 AD and became his fourth wife. By February 49 AD, she had persuaded Claudius to adopt her son Nero. After Nero's adoption, "Claudius" became part of his name: Nero Claudius Caesar Drusus Germanicus. Claudius had gold coins issued to mark the adoption. Classics professor Josiah Osgood has written that "the coins, through their distribution and imagery alike, showed that a new Leader was in the making." David Shotter noted that, despite events in Rome, Nero's step-brother Brittanicus was more prominent in provincial coinages during the early 50s. Nero officially formally entered public life as an adult in 51 AD—he was around 14 years old. When he turned 16 Nero married Claudius' daughter (and his step-sister), Claudia Octavia. Between the years 51 AD and 53 AD he gave several speeches on behalf of various communities including the Ilians; the Apameans, requesting a five-year tax reprieve after an earthquake; and the northern colony of Bologna, after their settlement suffered a devastating fire. Claudius died in 54 AD; many ancient historians claim that he was poisoned by Agrippina. Shotter has written that "Claudius' death in 54 AD has usually been regarded as an event hastened by Agrippina because of signs that Claudius was showing a renewed affection for his natural son," but he notes that among ancient sources Josephus was uniquely reserved in describing the poisoning as a rumor. Contemporary sources differ in their accounts. Tacitus says that Locusta prepared the poison, which was served to the Emperor by his food taster Halotus. Tacitus also writes that Agrippina arranged for Claudius' doctor Xenophon to administer poison, in the event that the Emperor survived. Suetonius differs in some details, but also implicates Halotus and Agrippina. Like Tacitus, Cassius Dio writes that the poison was prepared by Locusta, but in Dio's account it is administered by Agrippina instead of Halotus. In Apocolocyntosis, Seneca the Younger does not mention mushrooms at all. Agrippina's involvement in Claudius' death is not accepted by all modern scholars. Before Claudius' death, Agrippina had maneuvered to remove Britannicus' tutors and replace them with tutors she had selected. She was also able to convince Claudius to replace two prefects of the Praetorian guard who were suspected of supporting Brittanicus with a single commander, Burrus. Since Agrippina had replaced the guard officers with men loyal to her, Nero was able to assume power without incident. Most of what we know about Nero's reign comes from three ancient writers: Tacitus, Suetonius, and Greek historian Cassius Dio. According to ancient historians, Nero's construction projects were overly extravagant and the large number of expenditures under Nero left Italy "thoroughly exhausted by contributions of money" with "the provinces ruined." Modern historians, though, note that the period was riddled with deflation and that it is likely that Nero's spending came in the form of public works projects and charity intended to ease economic troubles. Nero was sixteen years old when he became emperor in 54 AD. This made him the youngest emperor until Commodus, who became emperor aged 15 in 177. The first five years of Nero's reign were described as Quinquennium Neronis by Trajan; the interpretation of the phrase is a matter of dispute amongst scholars. Nero's tutor, Seneca, prepared Nero's first speech before the Senate. During this speech, Nero spoke about "eliminating the ills of the previous regime.". H.H. Scullard writes that "he promised to follow the Augustan model in his principate, to end all secret trials intra cubiculum, to have done with the corruption of court favorites and freedman, and above all to respect the privileges of the Senate and individual Senators." His respect of the Senatorial autonomy, which distinguished him from Caligula and Claudius, was generally well-received by the Roman Senate. Scullard writes that Nero's mother, Agrippina "meant to rule through her son." Agrippina murdered her political rivals: Domitia Lepida, the aunt that Nero had lived with during Agrippina's exile; M. Iunius Silanus, a great grandson of Augustus; and Narcissus. One of the earliest coins that Nero issues during his reign shows Agrippina on the coin's obverse side; usually, this would be reserved for a portrait of the emperor. The Senate also allowed Agrippina two lictors during public appearances, an honor that was customarily only bestowed upon magistrates and the Vestalis Maxima. In AD 55, Nero removed Agrippina's ally Marcus Antonius Pallas from his position in the treasury. Shotter writes the following about Agrippina's deteriorating relationship with Nero: "What Seneca and Burrus probably saw as relatively harmless in Nero—his cultural pursuits and his affair with the slave girl Acte—were to her signs of her son's dangerous emancipation of himself from her influence." Britannicus was poisoned after Agrippina threatened to side with him. Nero, who was having an affair with Acte, exiled Agrippina from the palace when she began to cultivate a relationship with his wife Octavia. Jürgen Malitz writes that ancient sources do not provide any clear evidence to evaluate the extent of Nero's personal involvement in politics during the first years of his reign. He describes the policies that are explicitly attributed to Nero as "well-meant but incompetent notions" like Nero's failed initiative to abolish taxes in 58 AD. Scholars generally credit Nero's advisors Burrus and Seneca with the administrative successes of these years. Malitz writes that in later years, Nero panicked when he had to make decisions on his own during times of crisis. The Oxford Encyclopedia of Ancient Greece and Rome cautiously notes that Nero's reasons for killing his mother in 59 AD are "not fully understood." According to Tacitus, the source of conflict between Nero and his mother was Nero's affair with Poppaea Sabina. In Histories Tacitus writes that the affair began while Poppaea was still married to Rufrius Crispinus, but in his later work Annals Tacitus says Poppaea was married to Otho when the affair began. In Annals Tacitus writes that Agrippina opposed Nero's affair with Poppaea because of her affection for his wife Octavia. Anthony Barrett writes that Tacitus' account in Annals "suggests that Poppaea's challenge drove [Nero] over the brink." A number of modern historians have noted that Agrippina's death would not have offered much advantage for Poppaea, as Nero did not marry Poppaea until 62 AD. Barrett writes that Poppaea seems to serve as a "literary device, utilized [by Tacitus] because [he] could see no plausible explanation for Nero's conduct and also incidentally [served] to show that Nero, like Claudius, had fallen under the malign influence of a woman." According to Suetonius, Nero had his former freedman Anicetus arrange a shipwreck; Agrippina survived the wreck and swam ashore and was executed by Anicetus, who reported her death as a suicide. Modern scholars believe that Nero's reign had been going well in the years before Agrippina's death. After Agrippina's exile, Burrus and Seneca were responsible for the administration of the Empire. However, Nero's "conduct became far more egregious" after his mother's death. 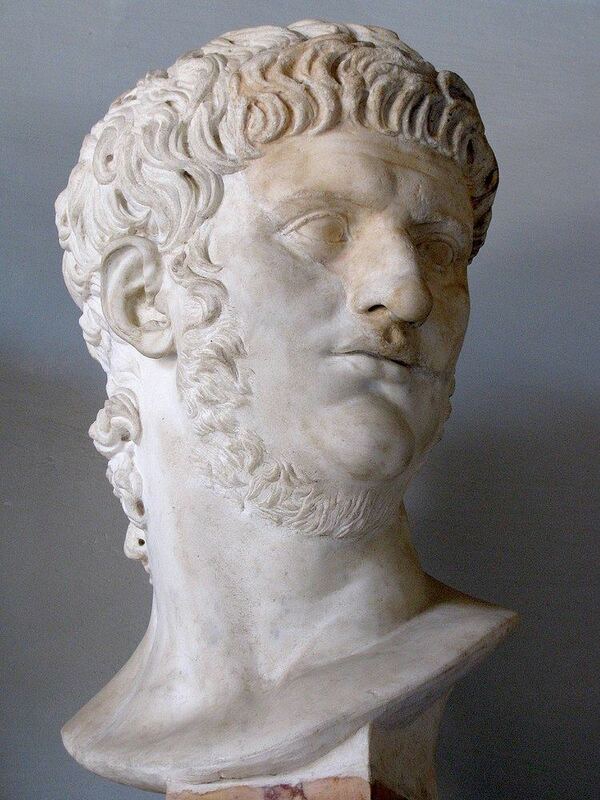 Miriam T. Griffins suggests that Nero's decline began as early as 55 AD with the murder of his stepbrother Britannicus, but also notes that "Nero lost all sense of right and wrong and listened to flattery with total credulity" after Agrippina's death. Griffin points out that Tacitus "makes explicit the significance of Agrippina's removal for Nero's conduct". In 62 AD, Nero's adviser Burrus died. That same year Nero called for the first treason trial of his reign (maiestas trial) against Antistius Sosianus. He also executed his rivals Cornelius Sulla and Rubellius Plautus. Jurgen Malitz considers this to be a turning point in Nero's relationship with the Roman Senate. Malitz writes that "Nero abandoned the restraint he had previously shown because he believed a course supporting the Senate promised to be less and less profitable." After Burrus' death Nero appointed two new Praetorian Prefects Faenius Rufus and Ofonius Tigellinus. Politically isolated, Seneca was forced to retire. According to Tacitus, Nero divorced Octavia on grounds of infertility, and banished her. After public protests over Octavia's exile, Nero accused her of adultery with Anicetus and she was executed. In 64 AD Nero married Pythagoras, a freedman. The Great Fire of Rome erupted on the night of 18 July to 19 July 64. The fire started on the slope of the Aventine overlooking the Circus Maximus. Tacitus, the main ancient source for information about the fire, wrote that countless mansions, residences and temples were destroyed. Tacitus and Cassius Dio have both written of extensive damage to the Palatine, which has been supported by subsequent archaeological excavations. The fire is reported to have burned for over a week. It destroyed three of fourteen Roman districts and severely damaged seven more. Tacitus wrote that some ancient accounts described the fire as an accident, while others had claimed that it was a plot of Nero's. Tacitus is the only surviving source which does not blame Nero for starting the fire; he says he is "unsure." Pliny the Elder, Suetonius and Cassius Dio all wrote that Nero was responsible for the fire. These accounts give several reasons for Nero's alleged arson like Nero's envy of King Priam and a dislike for the city's ancient construction. Suetonius wrote that Nero started the fire because he wanted the space to build his Golden House. The Golden House, also called the Domus Aurea included lush artificial landscapes and a 30-meter-tall statue of himself, the Colossus of Nero. The size of this complex is debated (from 100 to 300 acres). Suetonius and Cassius Dio alleged that Nero sang the "Sack of Ilium" in stage costume while the city burned. The popular legend that Nero played the fiddle while Rome burned "is at least partly a literary construct of Flavian propaganda[...]which looked askance on the abortive Neronian attempt to rewrite Augustan models of rule." In the wake of the fire, he made a new urban development plan. Houses built after the fire were spaced out, built in brick, and faced by porticos on wide roads. Nero also built a new palace complex known as the Domus Aurea in an area cleared by the fire. To find the necessary funds for the reconstruction, tributes were imposed on the provinces of the empire. The cost to rebuild Rome was immense, requiring funds the state treasury did not have. Nero devalued the Roman currency for the first time in the Empire's history. He reduced the weight of the denarius from 84 per Roman pound to 96 (3.85 grams to 3.35 grams). He also reduced the silver purity from 99.5% to 93.5%—the silver weight dropping from 3.83 grams to 3.4 grams. Furthermore, Nero reduced the weight of the aureus from 40 per Roman pound to 45 (8 grams to 7.2 grams). While Nero had retained some control of the situation, support for Galba increased despite his being officially declared a public enemy ('hostis publicus'). The prefect of the Praetorian Guard, Gaius Nymphidius Sabinus, also abandoned his allegiance to the Emperor and came out in support for Galba. In response, Nero fled Rome with the intention of going to the port of Ostia and, from there, to take a fleet to one of the still-loyal eastern provinces. According to Suetonius, Nero abandoned the idea when some army officers openly refused to obey his commands, responding with a line from Vergil's Aeneid: "Is it so dreadful a thing then to die?" Nero then toyed with the idea of fleeing to Parthia, throwing himself upon the mercy of Galba, or to appeal to the people and beg them to pardon him for his past offences "and if he could not soften their hearts, to entreat them at least to allow him the prefecture of Egypt". Suetonius reports that the text of this speech was later found in Nero's writing desk, but that he dared not give it from fear of being torn to pieces before he could reach the Forum. Returning, Nero sought for some place where he could hide and collect his thoughts. An imperial freedman, Phaon, offered his villa, located 4 miles outside the city. Travelling in disguise, Nero and four loyal freedmen, Epaphroditos, Phaon, Neophytus, and Sporus, reached the villa, where Nero ordered them to dig a grave for him. With his death, the Julio-Claudian dynasty ended. When news of his death reached Rome, the Senate posthumously declared Nero a public enemy to appease the coming Galba (as the Senate had initially declared Galba as a public enemy) and proclaimed Galba the new emperor. Chaos would ensue in the year of the Four Emperors. Modern scholarship generally holds that, while the Senate and more well-off individuals welcomed Nero's death, the general populace was "loyal to the end and beyond, for Otho and Vitellius both thought it worthwhile to appeal to their nostalgia." After Nero's suicide in 68, there was a widespread belief, especially in the eastern provinces, that he was not dead and somehow would return. This belief came to be known as the Nero Redivivus Legend. The legend of Nero's return lasted for hundreds of years after Nero's death. Augustine of Hippo wrote of the legend as a popular belief in 422. In Britannia in 59 AD, Prasutagus, leader of the Iceni tribe, a client king of Rome's during Claudius' reign died. The client state arrangement was unlikely to survive the death of the former Emperor. Prasutagus' will leaving control of Iceni to his wife Boudicca was denied and when Catus Decianus scourged Boudicca and raped her daughters, the Iceni revolted. They were joined by the Trinovantes tribe, and their uprising became the most significant provincial rebellion of the 1st century AD. Under Boudicca the towns of Camulodunum (Colchester), Londinium (London) and Verulamium (St Albans) were burned and a substantial body of legion infantry destroyed. The governor of the province Gaius Suetonius Paulinus assembled his remaining forces and defeated the Britons and restored order but for a while Nero considered abandoning the province. Julius Classicianus replaced Decianus as procurator. Classicianus advised Nero to replace Paulinus, who continued to punish the population even after the rebellion was over. Nero decided to adopt a more lenient approach to governing the province, and appointed a new governor, Petronius Turpilianus. The Roman victory had come at a time when the Parthians were troubled by revolts; when this was dealt with they were able to devote resources to the Armenian situation. A Roman army under Paetus surrendered under humiliating circumstances and though both Roman and Partisan forces withdrew from Armenia, it was under Parthian control. The triumphal arch for Corbulo's earlier victory was part-built when Parthian envoys arrived in 63 AD to discuss treaties. Given imperium over the eastern regions, Corbulo organised his forces for an invasion but was met by a Parthian delegation. An agreement was reached with the Parthians: Rome would recognize Tiridates as king of Armenia, only if he agreed to receive his diadem from Nero. A coronation ceremony was held in Italy 66 AD. Dio reports that Tiridates said "I have come to you, my God, worshiping you as Mithras." Shotter says this parallels other divine designations that were commonly applied to Nero in the East including "The New Apollo" and "The New Sun." After the coronation, friendly relations were established between Rome and the eastern kingdoms of Parthia and Armenia. Artaxata was temporarily renamed Neroneia. Nero studied poetry, music, painting and sculpture. He both sang and played the cithara (a type of lyre). Many of these disciplines were standard education for the Roman elite, but Nero's devotion to music exceeded what was socially acceptable for a Roman of his class. Ancient sources were critical of Nero's emphasis on the arts, chariot-racing and athletics. Pliny described Nero as an "actor-emperor" (scaenici imperatoris) and Suetonius wrote that he was "carried away by a craze for popularity...since he was acclaimed as the equal of Apollo in music and of the Sun in driving a chariot, he had planned to emulate the exploits of Hercules as well." In 66 AD Nero participated in the Olympics. The games had been postponed for a year so Nero could participate, and artistic competitions were added to the athletic events. Nero won every contest in which he was a competitor. During the games Nero sang and played his lyre on stage, acted in tragedies and raced chariots. Champlin writes that though Nero's participation "effectively stifled true competition, [Nero] seems to have been oblivious of reality." Nero established the Neronian games in 60 AD. Modeled on Greek style games, these games included "music" "gymnastic" and "questrian" contents. According to Suetonius the gymnastic contests were held in the Saepta area of the Campus Martius. Though more of a poet than historian, Lucanus (c. 39–65) has one of the kindest accounts of Nero's rule. He writes of peace and prosperity under Nero in contrast to previous war and strife. Ironically, he was later involved in a conspiracy to overthrow Nero and was executed. Philostratus II "the Athenian" (c. 172–250) spoke of Nero in the Life of Apollonius Tyana (Books 4–5). Though he has a generally bad or dim view of Nero, he speaks of others' positive reception of Nero in the East. The Talmud adds that the sage Reb Meir Baal HaNess, Rabbi Meir or Rabbi Meir Baal HaNes (Rabbi Meir the miracle maker) was a Jewish sage who lived in the time of the Mishna a prominent supporter of the Bar Kokhba rebellion against Roman rule. He was considered one of the greatest of the Tannaim of the third generation (139-163). According to the Talmud, his father was a descendant of the Roman Emperor Nero who had converted to Judaism. His wife Bruriah is one of the few women cited in the Gemara. He is the third most frequently mentioned sage in the Mishnah. The first text to suggest that Nero ordered the execution of an apostle is a letter by Clement to the Corinthians traditional dated to around 96 A.D. The apocryphal Ascension of Isaiah, a Christian writing from the 2nd century says, "the slayer of his mother, who himself (even) this king, will persecute the plant which the Twelve Apostles of the Beloved have planted. Of the Twelve one will be delivered into his hands" was interpreted to mean Nero. The Sibylline Oracles, Book 5 and 8, written in the 2nd century, speak of Nero returning and bringing destruction. Within Christian communities, these writings, along with others, fueled the belief that Nero would return as the Antichrist. In 310, Lactantius wrote that Nero "suddenly disappeared, and even the burial place of that noxious wild beast was nowhere to be seen. This has led some persons of extravagant imagination to suppose that, having been conveyed to a distant region, he is still reserved alive; and to him they apply the Sibylline verses", Lactantius maintains that it is not right to believe this. In 422, Augustine of Hippo wrote about 2 Thessalonians 2:1–11, where he believed Paul mentioned the coming of the Antichrist. Though he rejects the theory, Augustine mentions that many Christians believed Nero was the Antichrist or would return as the Antichrist. He wrote, "so that in saying, 'For the mystery of iniquity doth already work,' he alluded to Nero, whose deeds already seemed to be as the deeds of Antichrist." The concept of Nero as the Antichrist is often a central belief of Preterist eschatology.